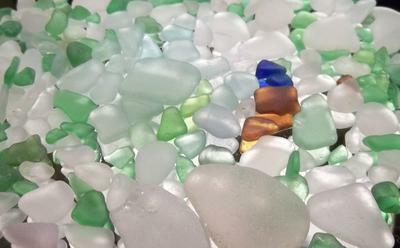 Lake Erie, from Cleveland to Conneaut, Ohio, is a mecca for beach glass and beach glass enthusiasts. The old saying, "The early bird catches the worm" can be almost be applied to beach glass hunting. Although, depending on the way the waves and tide are interacting, afternoon may be your best bet. To me there is nothing better than kicking off my shoes and stepping into the warm sand to walk along the beach. Sometimes a brightly colored gem of glass will be right on top waiting for the picking, other times it will be on the edge of the water, glistening...waiting. With that said, I have also been on the beach with snow and made several fascinating finds! From my experiences on the beaches in Ashtabula and Lake County, the rewards have been spectacular. I have found reds, oranges, yellows, pinks, greens, blues, browns, whites. If you ask me which piece is my favorite...it's every piece I pick up. Some pieces are jewelry quality, and some are meant to be in a glass jar so I can see them every day. Beach glass hunting/collecting is a great family activity as well. Something that costs nothing but reaps benefits. If you haven't found your first piece of beach glass...take off your shoes, dip your feet in the surf and sand and start looking. And don't forget that zip-loc bag to carry your treasures in! "True tides—changes in water level caused by the gravitational forces of the sun and moon—do occur in a semi-diurnal (twice daily) pattern on the Great Lakes. "Studies indicate that the Great Lakes spring tide, the largest tides caused by the combined forces of the sun and moon, is less than five centimeters in height. "These minor variations are masked by the greater fluctuations in lake levels produced by wind and barometric pressure changes. "Consequently, the Great Lakes are considered to be non-tidal." So, yes, there are tides. Will you ever notice or be affected by them? No. Lake Erie does have tides, of sorts. I have lived on the lake for many years, and we get tidal effects...water rising and lowering. Of course, most of it can be attributed to wind and barometric pressure, but do not be abusive because someone is observing the rising and lowering of lake water and thinks it is tidal. Our winds tend to pick up when the sun goes down, so our water level may come up or go down at about that same time everyday. It is not truly a tide, but it does have an effect on beachcombing. I love finding birds of a feather, just knowing y'all are out there makes me know I'm not crazy! I live in Bucks County, PA along the Delaware river and have been fortunate enough to have found some lovely pieces of river glass along the Delaware and the creeks in the area. Most are craft grade or can be put in the rock tumbler to finish to craft grade, but a few are what I consider to be true treasures from the past and are what keep me looking for more! I know we could drive an hour to the Jersey shore to hound miles of beaches for sea glass, but I'm rather a purist and find the hunt to be more personal and meaningful as I find great pieces right here at home. 'd love to hear from any of you who might know of places to go rockhounding, mudlarking, digging and picking in this part of Pennsylvania and across the river in New Jersey. I'm going to make this site a regular stop in my online research gathering, my daughter lives in Portland and also enjoys hunting on the beaches of the Oregon coast, but am ok with suggestions being sent to my email and hope it's not against the rules to include it here. Send to kerrizemail at yahoo dot com and I'll check in with y'all here again soon. Bring in spring with happy hunting! We have a cottage on lakevErie in Ontario Canada. I was looking for a good book for my grandson since he loves looking for sea glass. Any suggestions? Hi Anon, the book that nearly all sea collectors own is Pure Sea Glass: Discovering Nature's Vanishing Gems by Richard LaMotte . We all love it! 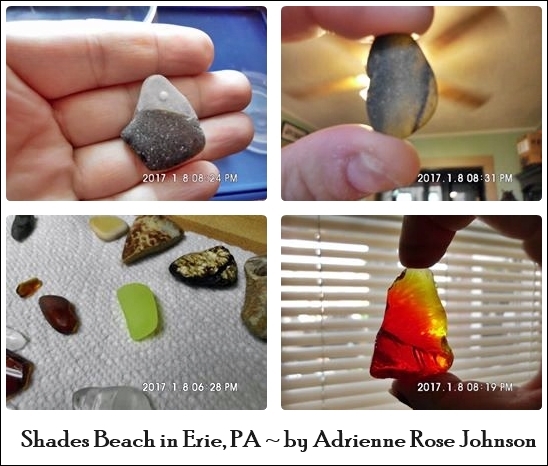 I live on the Canadian side of Lake Erie and bring home beach glass with every walk. Sometimes handfuls, sometimes just a few. I have been collecting for a least 25 years. I absolutely love this page! Thank you for the nice comment, Shaina. Winter collecting - sea glass Lake Erie? Here in Erie there are ice dunes that line the shore in winter. I don't believe the glass could make it onto the beach right now, but the scenery is really cool to see. South Shore Lake Erie - Summer Fun! I have found some really lovely pieces and turned them into jewelry. Honestly though, I just love beach glass and don't care if they are jewelry grade. They're all jewels to me! I rarely find any jewelry-grade beach glass, but I usually look in Huron and Vermilion. Ohiolady....I was born there. Perhaps you should do some research to know that there IS a high and low tide for Lake Erie. Because there is much less water in the lake than in the ocean, it isn't as noticeable. Thank you for your commentary. Now, read up! There are no discernible tides on lake Erie, What are you talking about?!?! Have you even been there????? Do you have any photos of the glass i might find? I think OdysseySeaGlass will put them up here if you send them in. Was at the beach today found three quarter sized cobalt blue pieces awesome, and a strange piece that looks like it has real gold in it ? I stopped at a yard sale and they had a small bag of beach glass. My heart began to quiver..then it raced when I saw a chunk of peach colored glass! That's awesome! Every time is like the first time for me. I get so excited when I find a piece! can't wait to go back for more. I was home last week and able to get to the beach to hunt! I found a beautiful yellow, and nice red. Oh I miss the beach! Thank you for the comment. Dark grey pieces are not usually found! In the future though, please do not use capital letters, though, as caps represent shouting on the internet. cobalt blue - woo hoo! Wish I had some of it!! I am going home to the shores of Lake Erie in June. I cannot wait to get to the beach and get more glass! If you want to feel your heart beat out of your chest, Google Fort Bragg Beach...it is beach glass on steroids!! I WILL go there one day! I am So in love with beach glass! The best place I have found to collect it is on the island of Barbados. I also hear the Puerto Rico is a mecca for it as well! I am curious if you are any relation to Lisa Lynch (Clarksville) or Tommy? If so, please contact me at mikeb65634 (at) aol dot com! Maybe we have seen each there! Surprised I haven't bumped into you...with both of our heads down!! I love collecting beach glass. I love every piece I pick up - no piece is too small! Wish I was there right now! You know, I've been collecting beach glass for years until today.. not knowing there are a bunch more frieks out there just like me!